2015-16 Exquisite Collection Connor McDavid RC Rookie Quad Jerseys #61/99 MINT!! Everything else is weight based. 2013-14 PANINI DOMINION SETH JONES PEERLESS PATCHES /50 ROOKIE PATCH AUTO HOTTT! 2013-14 PANINI DOMINION SETH JONES PEERLESS PATCHES /50 AUTOGRAPH 13-14. Condition is Like New. Brock Boeser 2017-18 MVP Black Rookie Card #/5 bgs Graded 9!! TYLER SEGUIN 10-11 CUP Auto 3 CLR Patch Rookie Card RC 51/99 BGS 9 MINT!! 2015-16 BLACK DIAMOND RELICS SP ROOKIE CONNOR MCDAVID RC S#32/99 BGS 9 MINT WOW! This is a unique 1/1 card that is authenticated by JSA and slabbed (not graded) by Beckett Grading Services. MY PRICES ARE FIRM. IF YOU DO I MAY PERMANENTLY BLOCK YOUR ACCOUNT. 2016 Leaf Executive Collection Masterpiece authentic cut signature card of 1980 U.S. Hockey Team Miracle on Ice goalie Jim Craig. This is a unique 1/1 card that is authenticated by JSA and slabbed. MY PRICES ARE FIRM. This is a unique 1/1 card that is authenticated by JSA and slabbed. MY PRICES ARE FIRM. IF YOU DO I MAY PERMANENTLY BLOCK YOUR ACCOUNT. P.K. SUBBAN 10-11 CUP Auto 3 CLR Patch Rookie Card RC 99/99 BGS 9 MINT!! 2008-09 Montreal Canadiens Centennial HOF Induction INKS Guy Lapointe 14/93 !! 2016 Leaf Executive Collection Masterpiece authentic dual cut signature card of 1980 U.S. Hockey Team Miracle on Ice players Jim Craig and Dave Silk. This is a unique 1/1 card that is authenticated by JSA and slabbed. Complete set 1-100 with graded Matthews 9.5 -Marner 9.5- Barzal 9.5 This is the hardest 2016-17 set only 21 complete sets. All cards in the set are numbered to 49. This is a unique 1/1 card that is slabbed (not graded) by Beckett Grading Services. MY PRICES ARE FIRM. IF YOU DO I MAY PERMANENTLY BLOCK YOUR ACCOUNT. 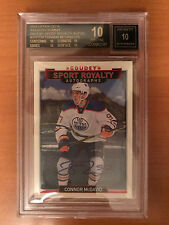 2016 Industry Summitt #SRPCM Connor McDavid 14/15 BGS (Black Label) 10 Pristine!